We are pleased to have acquired a large collection of photographs taken by the late John Rumsey. John was a Master at Hereford Cathedral School who organised several tours under the banner of the Hereford Cathedral School Railway Society. His photographs were taken between 1957 and 1966. The early photographs are all in black and white and were mostly taken on shed during the visits. Later he switched to colour. 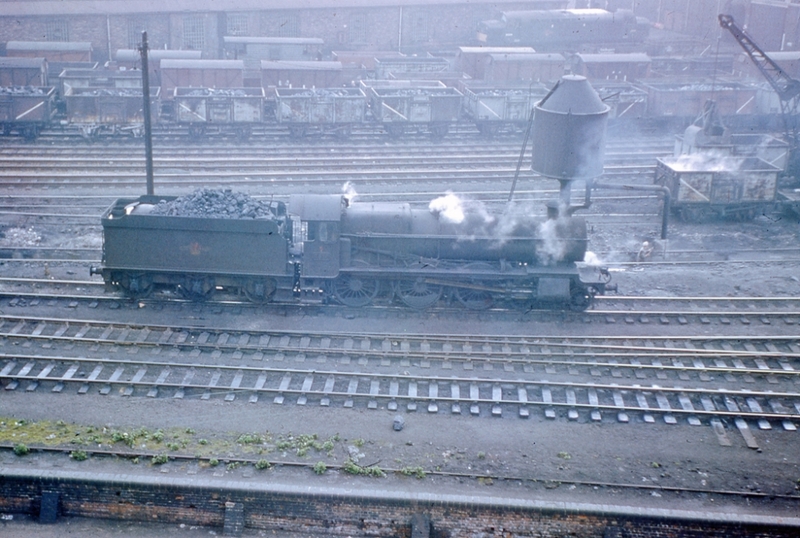 Early In 1965 (the exact date is not known) he took some photographs at Worcester. "Modified Hall" class No.7909 "Heveningham Hall" in grimy condition and without front number plate stands outside the Shrub Hill Station end of the running shed at Worcester. The locomotive was new in 1950 and was based at Worcester from November 1964 until July 1965 before going to Oxford. It was withdrawn in November 1965. 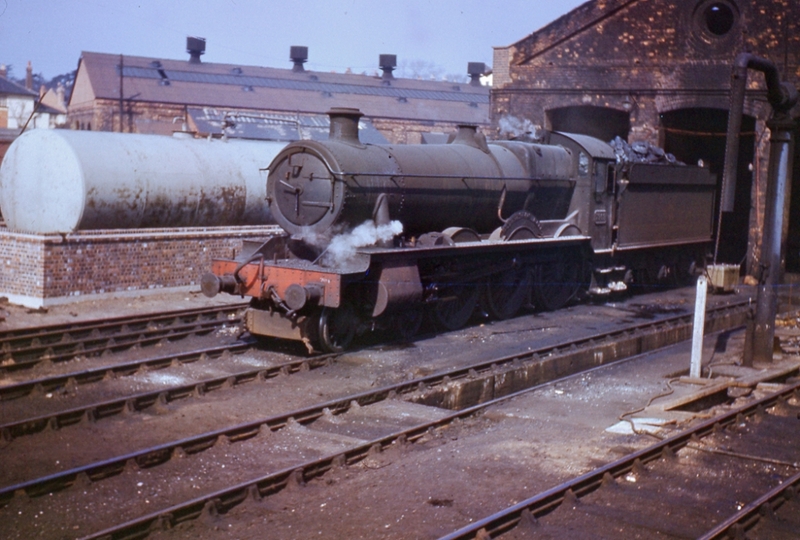 The diesel tank alongside the locomotive is already showing signs of use and by comparing its condition with similar photographs the date taken is probably April 1965. By 1950 the Western Region was running out of names for its "Hall" class as Heveningham is in Suffolk. John took two photographs from the familiar vantage point at Railway Walk. 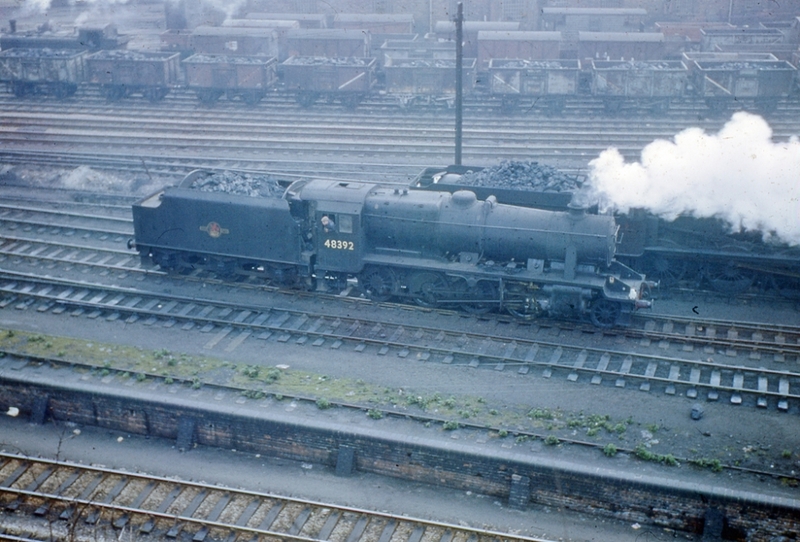 Above: Stockport (Edgeley) based ex-LMSR "8F" class 2-8-0 No.48392 was in commendably clean condition in contrast to Worcester's "Grange" class 4-6-0 No.6819 "Highnam Grange" (below) which was also missing its nameplates. Note the English Electric class 37 diesel locomotive stabled outside the temporary diesel depot on the other side of the lines to Shrub Hill Station. If the depth of his collection is a good indication of his interest then John Rumsey was keen on much more than simply locomotives. 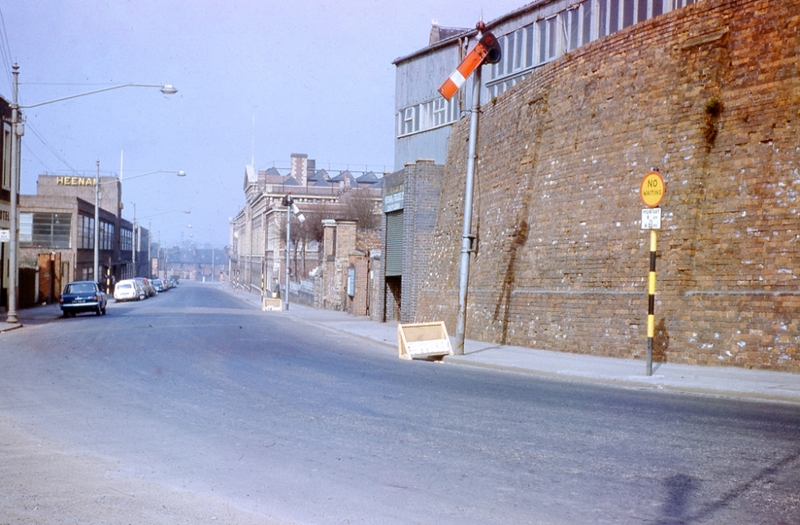 Although the Vingar Works branch line had ceased to operate by the time of his visit the railway signals used for traffic control on Shrub Hill Road were still in place, and note also the street lights mounted on former tramway poles . 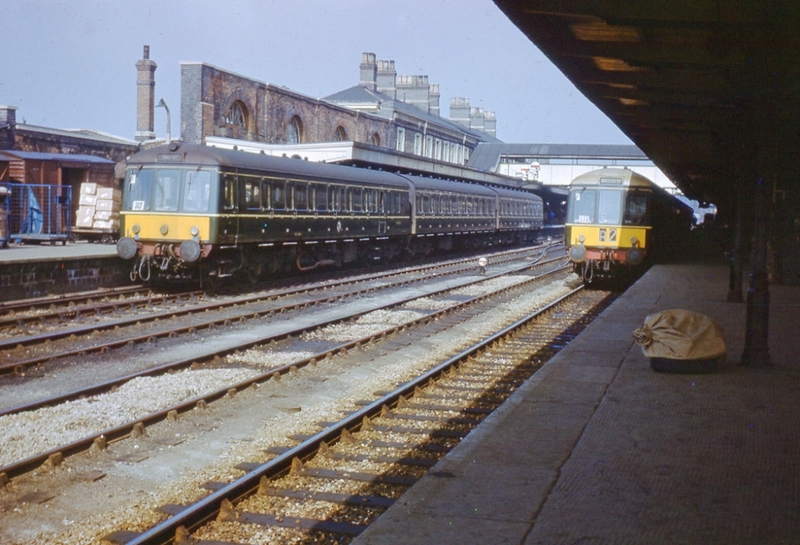 Before leaving Worcester on a journey to Birmingham, John took this photograph showing a pair of green-livery three-car diesel multiple units at Shrub Hill Station. Nearest to the camera on the left hand side of the photograph at Platform 1 is a Driving Motor Brake Second (one of Nos.50050-50091) (later class 116) unit with a four-light layout and small yellow panel on the cab end. At Platform 2 is one of the later units of the same class and fitted with a two-aspect headcode panel.